This will sound familiar to readers of this and other bubble blogs. It's nice to see the world's most respected news magazine echoing our thoughts. Markets are too dependent on unsustainable government stimulus. Something’s got to give. Many governments responded to the crisis by, in effect, taking the debt burden off the private sector’s balance-sheets and putting it on their own. This caused a huge gap to open up in government finances. Deficits in America and Britain, for instance, stand at more than 10% of GDP. Most developed-country governments have managed to finance these deficits fairly easily so far. In the early stages of the crisis, investors were happy to opt for the safety of government bonds. Then central banks resorted to quantitative easing (QE), a polite term for the creation of money. The Bank of England, for example, has bought [read: printed] the equivalent of one year’s entire fiscal deficit. Investors tempted to take comfort from the fact that asset prices are still below their peaks would do well to remember that they may yet fall back a very long way. The Japanese stock market still trades at a quarter of the high it reached 20 years ago. The NASDAQ trades at half the level it reached during dotcom mania. Today the prices of many assets are being held up by unsustainable fiscal and monetary stimulus. Something has to give. Something has to give, all right. My best guess is that something will be fiat currencies around the world. Haven't Obama and Zimbabwe Ben proven that they will stop at nothing to destroy the dollar and inflate the world's debt away? If assets are over-valued then cash is under-valued? I'm with you. 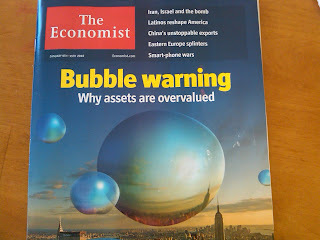 The only overvalued assets are: world currencies and bonds. Thanks to the economy, 5 years ago walmart didn't have as many customers as it has today. It has more customers now than ever. 5 years ago Walmart traded at 20x earnings and had a single digit ROE. Now it trades at 15x earnings and is hitting 20% roe. 5 years ago walmart had 11.7% more shares out standing... heck 5 years ago there were only 15 zillion dollars, now, thanks to the financial crisis, there are 600 zillion dollars outstanding. More dollars, less walmart shares. I think there's a bubble in dollars not assets like walmart. No argument here, walmart man. I love Wal-Mart, Wal-Mart stock, and People of Wal-Mart. Only problem is, if the dollar collapses, all that stuff Wal-Mart imports from China is gonna get a hell of a lot more expensive. Walmart is the most efficient retail distribution system known to man. Walmart is not the storefront of China, Inc.